Dentigerous cysts are benign odontogenic cysts occurring from the dental follicle of an unerupted or developing tooth. This cyst is usually asymptomatic but has the potential to attain a large size and become aggressive. These lesions are usually associated with the impacted third molars and canines. The treatment for this cyst is the extraction of the impacted tooth and enucleation of the cyst. A prosthodontist should be involved in the restoration of the lost structure from the point of diagnosis to establish proper function and improve the quality of life for the patient. We present a case report of a dentigerous cyst associated with an impacted mandibular molar which was surgically removed, and the defect was closed by an obturator fabricated before the surgical procedure. A dentigerous or follicular cyst is usually formed by the accumulation of fluid between the reduced enamel epithelium and the completely formed tooth crown or in the layers of the reduced enamel epithelium. These cysts are benign odontogenic lesions arising from the impacted, embedded, or unerupted tooth. A dentigerous cyst occurs in the permanent dentition, especially in association with the impacted mandibular third molars and impacted maxillary canines with the highest incidence in the second and third decades of a patient's life. Radiographically, the dentigerous cyst appears as a well-defined radiolucency with a radiopaque border and surrounds the crown of an impacted or unerupted tooth. The microscopic features of dentigerous cysts must be evaluated to rule out a transformation to an ameloblastoma or squamous cell carcinoma. Because of its malignant potential to invade adjacent vital structures, the treatment protocol for a dentigerous cyst involves surgical enucleation and extraction of the impacted or unerupted tooth associated with the cyst. This results in a loss of function and esthetics, which would affect both the physiological and psychological well-being of the patient. Therefore, a plan for the reconstruction of the excised site should start at the diagnosis stage. The type of reconstruction depends on the extent of resultant bony and soft-tissue defect, and effective treatment requires a multidisciplinary approach between prosthetic and surgical teams. A 61-year-old female reported to the Faculty of Dental Sciences, Sri Ramachandra University, Chennai, India, with a swelling in the right mandibular posterior region, with no relevant medical history. Intraoral examination revealed a bony swelling around teeth 46, 47, and 48 in the body of the mandible. 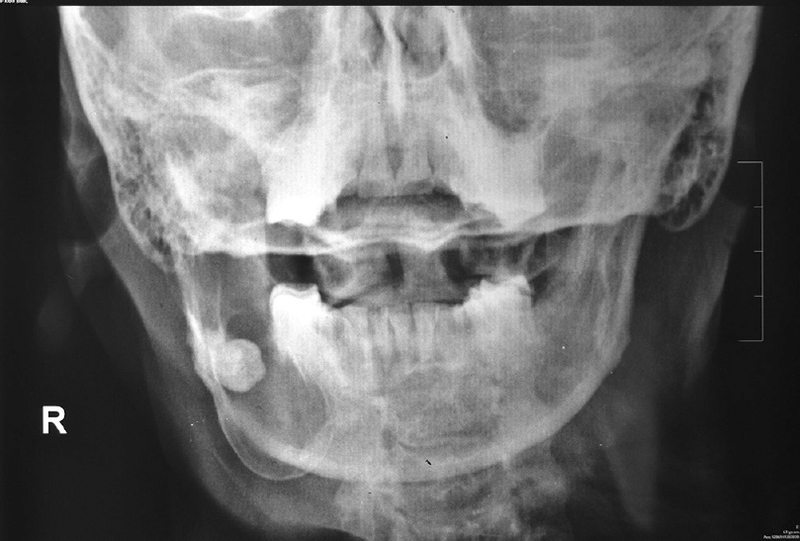 Radiographic examination with the orthopantomogram [Figure 1] showed a well-defined unilocular radiolucent lesion in the body of the mandible involving the impacted third molar. On clinical and radiographic examination, the differential diagnosis was given suggestive of a dentigerous cyst. The patient consented to the removal of the impacted tooth along with the lesion, and preliminary routine blood investigations were carried out. A prosthetic opinion was obtained before the day of surgical excision. After evaluation, an impression was taken for fabrication of a surgical obturator. Immediate prosthetic rehabilitation affords many advantages for the surgical and postoperative management of the patient with a maxillofacial defect. 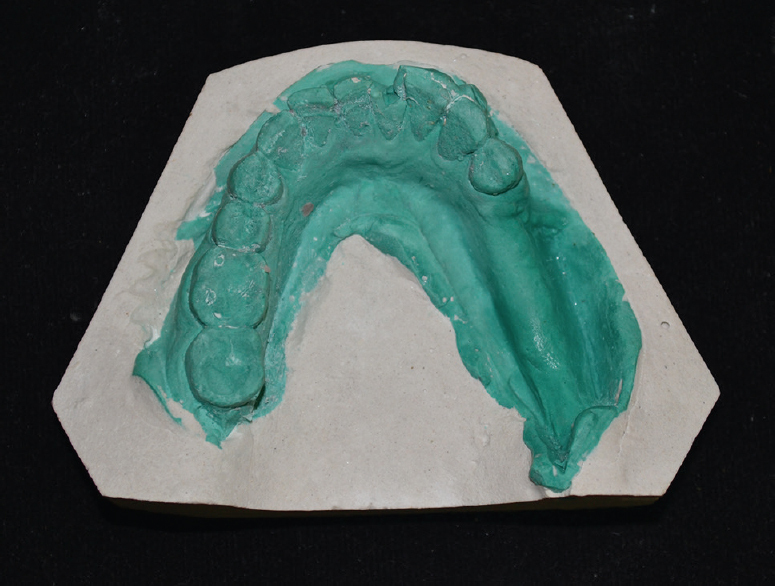 The diagnostic cast was poured with Type III dental stone (Glastone ® Dental Stone, Dentsply Intl. ), and the lesion site and teeth to be removed were marked and scraped out [Figure 2]. The denture base for the delayed surgical obturator was fabricated with the use of chemically cured polymethyl methacrylate (PMMA), and acrylic semi-anatomic teeth were used for teeth arrangement ( first, second premolar, and first molar). Additional retention for the interim obturator was provided by incorporating a circumferential C-Clasp at tooth 43 near the defect site [Figure 3]. 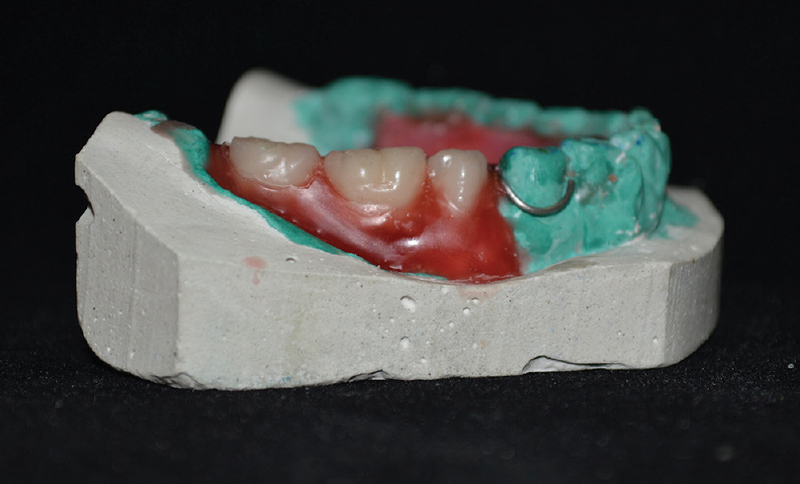 The obturator was then processed with heat-cure PMMA resin followed by final finishing and polishing. The prosthesis was designed in such a way that it acts as a barrier to prevent the entry of food debris into the cystic cavity. Following surgical enucleation of the lesion and the impacted third molar [Figure 4], the remaining bony cavity was curetted, and bony margins were smoothened and irrigated with normal saline. A medicated gauze pack was applied to the defective site. The patient was given antibiotic medication and asked to report after 10 days for the fabrication of the delayed surgical obturator prostheses. A review was done within 7 days, and the healing was observed to be satisfactory for placing obturator presented in [Figure 5]a, and the radiographic examination is presented in [Figure 5]b. According to the remaining teeth and the surgical defect, the site was classified as a Cantor and Curtis Type I defect in the mandibular region. Insertion of the obturator was done with functional relining of the defect site with tissue conditioner material [COE-COMFORT Intl, Tissue conditioner, GC America, Inc., IL, USA; [Figure 6]. The interim obturator acts as a barrier for the defect and allows the soft-tissue changes in the defect area. Postinsertion instructions were given for the maintenance of oral hygiene and improving phonetics, which was also reinforced during the follow-up periods. The histopathological report [Figure 7]a and [Figure 7]b showed a typical feature of a dentigerous cyst with non-keratinized epithelium, Rushton bodies in connective tissue, and blood-tinged cystic lumen. The patient also informed about having soft diet on the side of obturator to prevent excessive masticatory force. One of the main objectives of oral-maxillofacial prosthodontists, when treating cysts and tumors, is to eliminate disease and improve the quality of life for a patient. This includes the reconstruction of the facial contours which influences functional factors, psychological factors, and orofacial pain or discomfort. On radiographic examination, dentigerous cysts appear as well-defined, round, corticated, lucent lesions around the crowns of an impacted tooth, usually third molars , with the differential diagnosis of an odontogenic ketatocyst and ameloblastoma. These cysts can grow extremely large asymptomatically (as seen in this case) and remain undetected until they become large enough to cause bony expansion and asymptomatic facial swelling., The treatment of these lesions includes the surgical removal of the impacted tooth followed by enucleation. In the present case, after the surgical procedures, the cavity was prosthodontically treated immediately with an obturator having replaced the missing teeth too, which acts as a surgical closure, supports skin grafts, and maintains a close adaptation to the cavity walls when the treatment with a definitive obturator takes longer and also provides function. Surgical obturator can be immediate or delayed, immediate surgical obturator is given during the surgical procedure while the delayed surgical obturator is given after a week postoperatively. Surgical plate given at the time of surgery may not serve the functional requirement of the patient. Moreover, the impression procedure done immediately after the surgical procedure is more traumatic to the patient, and hence, in this case, a delayed surgical obturator similar to an interim obturator was fabricated before the start of the surgical procedure. The patient would be wearing the prosthesis for 6–8 months until definitive treatment is undertaken. Psychosocial support before and after surgery, followed by repeated, stepwise elucidation of the therapy explaining the treatment outcomes to the patient, postinsertion instructions about obturator use, and routine psychological care, offered to patients leads to successful overall treatment. Impression procedures done immediately after a surgical procedure are more traumatic to the patient, and hence, the role of the prosthodontist starts from the day of pre-surgical treatment planning. The fabrication of the delayed surgical obturator mimicking interim obturator before the surgical procedure enables better comfort for the patient. The obturator fabricated in the present case report is simple to fabricate, protects the site, and provides the functional purpose of mastication. Kim SG, Park CY, Kang TH, Jang HS. Clinicopathologic study on cysts and postoperative cysts in maxillary sinus. J Korean Assoc Maxillofac Plast Reconstr Surg 2000;22:568-76. Larsen PE. Odontogenesis and odontogenic cysts and tumors. In: Cummings CC, editor. Otolaryngology Head and Neck Surgery. 2nd ed. St. Louis, MO: Mosby-Year Book Inc.; 1993. p. 1572-3. Kim KW, Lee JH. Clinical study of cysts in the jaws. J Korean Assoc Maxillofac Plast Reconstr Surg 1999;21:166-73. Boyes-Varley JG, Howes DG, Davidge-Pitts KD, Brånemark I, McAlpine JA. A protocol for maxillary reconstruction following oncology resection using zygomatic implants. Int J Prosthodont 2007;20:521-31. Motamedi MH, Talesh KT. Management of extensive dentigerous cysts. Br Dent J 2005;198:203-6. Ingleheart M, Ahamed B, Parveen N, Yazdanie N. Oral health related quality of life: An introduction. In: Ingleheart M, Begramian R, editors. Oral Health Related Quality of Life. Chicago: Quintessence; 2002. p. 13-28. Gaoz PW, White SC. Oral Radiology: Principles and Interpretation. Vol. 3. St. Louis, MO: Mosby; 1994. p. 398-676. 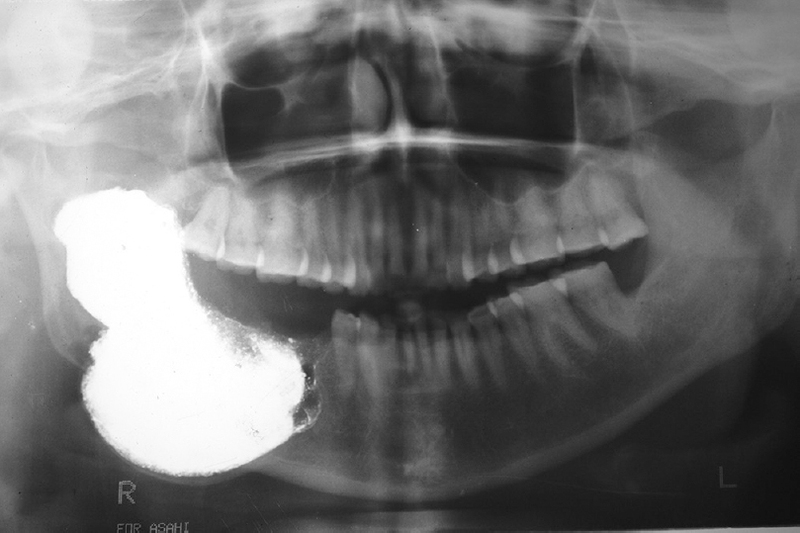 McCrea S. Adjacent dentigerous cysts with the ectopic displacement of a third mandibular molar and supernumerary (forth) molar: A rare occurrence. Oral Surg Oral Med Oral Pathol Oral Radiol Endod 2009;107:e15-20. Freitas DQ, Tempest LM, Sicoli E, Lopes-Neto FC. 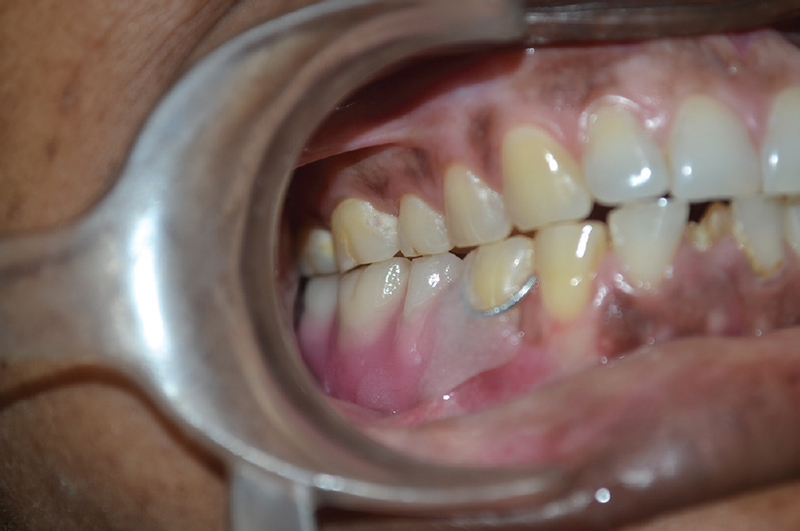 Bilateral dentigerous cysts: Review of the literature and report of an unusual case. Dentomaxillofac Radiol 2006;35:464-8. Neville BW, Damm DD, Allen CM, Bouquot J. Oral and Maxillofacial Pathology. 3rd ed. St. Louis, MO: Saunders; 2008. p. 679-82.